And there are states that still practice torturing, George W. Bush's administration has even legalized them in Guantanamo, I’m not joking, the water torture is consider a normal practice to make terrorism suspects to confess. Aristotle didn’t know anything about George W. Bush back then, he only knew about democracy, poor chap! What remains? For me to apologize to my ancient compatriot, if he was still alive most likely he would be victim of torturing as well! 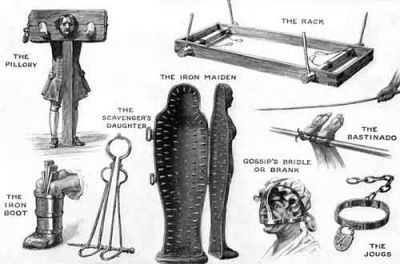 Moreover, the illustration of the Inquisition where monks are shown enjoying a spectacle of torture which accompanies this article is probably meant to be satirical but in fact it is not historically correct. 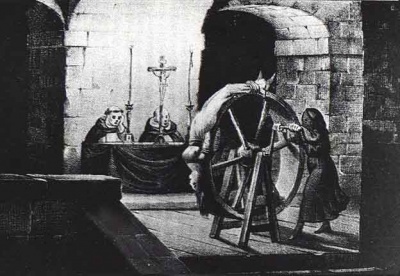 There surely was a Church-sponsored Inquisition in Medieval times, all the way to Galileo, but its function was not that of torturing heretics but that of examining and judging what they wrote and then determine their orthodoxy. That was its sole function. Was there also torture? Yes, but that was left to the civil authorities to execute, which usually were quite happy to cooperate. So, the illustration is not correct. Returning to Aristotle, as you know, Thanos, Aristotle wrote a whole book on Greek Tragedy called “The Poetics” where he makes the insightful point of catharsis of the emotions which consists in the viewer identifying and experiencing emotions portrayed on the stage, (torture being one of them, or the killing of one’s children as in Medea and the suffering of the hero usually ending in death), which he would never wish to experience and contemplate in real life. Art has that kind of power, to transform even the sordid and the ugly and that’s why Aristotle calls drama more philosophical than history. What’s the point of it all, you may ask. This: Aristotle, like Tony Judt of whom I wrote a few days ago (and that some hacker decided to inquisitorially deface the next day…) is making the point that we ought not to forget what is ugly and perhaps, if we have that ability, we ought to transform it into art. To be fair to the Church, while remembering the Inquisition and learning its lessons (surely not learned by the Nazis in question and neither by the Stalinist Communists) we should remember that she was, throughout its history, a patron of the arts. Let’s look at everything and not only at the axes we wish to grind. Just musings on the topic of torture. Psychological torture (emotional blackmails and threats, using other's feelings of guilt and shame, etc) is certainly torture. Sadly I lived both and yes, who tortures attacks not only the people who are tortured, but all the people who like and care for them too, and democratic societies as we commonly understand they should be as well. Art has not only the power to transform the ugly into something beautiful, but also to change things socially. That's its greatest thing. Art is incredibly political and anti-political by essence at the same time. The form is a completely different form, the means too, and the personal statements are there as well. Everything that fosters the utmost free expression of a human being and its best qualities and talents is socially very developed and anti-political.